There are about seven-zillion start-up managers. I think we’ve featured about 60% of them at one time or another. This redundancy is not without purpose. We are sticklers for eliminating excess start-up programs, because start-up programs run in the background soaking up your precious system resources. The number one reason for computer sluggishness is too many programs starting with Windows. Really. So many programs we install these days think they are so important and necessary that you’ll want them available every time you start your computer. You don’t need them to start up with Windows of course, you can always run them when you want from the start menu. But printers, and scanners, and chat programs, and audio programs, and image editors, and just about everything under the sun wants to start with Windows these days – and you don’t need most of them to start with Windows. Sometimes you just can’t seem to get the darn things to stop starting with Windows. They come back like ghosts from the past. The only things you need to start with Windows are essential Windows components, your security programs, and a very select few others. Yes, there are a lot of start-up managers. But start-ups have so many places they hide – mostly deep in the registry – they can hide from your onslaught of start-up managers. It seems that no start-up manger in the world finds all the ones hiding in the inner sanctum of your PC….until now. 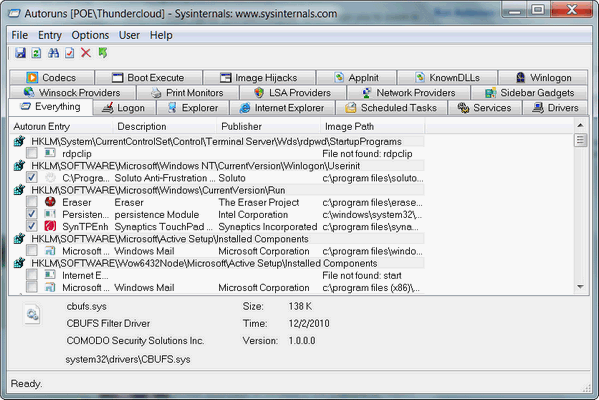 Let us introduce you to Sysinternals Autoruns. The one program with so many features, you might want to take a look at the help files. But the autorun “Everything” feature shows you every single program starting with Windows no matter where they hide. And some of it, we’ll bet you didn’t even know you had. If you right-click any of the auto-run entries, you can do a look-up to see if it’s something you don’t need or something you need. Most everything can be unchecked without harming your computer. Just be careful you don’t disable the startups having to do with your security programs – antispyware, antivirus, antimalware and the like. Autoruns gives you a brief description of each startup, and a lookup for each, but still you will need to take care which startups you uncheck. Make sure you have a pretty good idea of what it is you’re disabling. Make sure you run a system restore before you use the program for the first time, and until you are familiar with it. It’s a serious program that does serious work – but using it correctly can really help you remove pesky startups that you don’t even realize are starting with Windows – and this will make your computer start up, shut down, and run faster. “This utility, which has the most comprehensive knowledge of auto-starting locations of any startup monitor, shows you what programs are configured to run during system bootup or login, and shows you the entries in the order Windows processes them. These programs include ones in your startup folder, Run, RunOnce, and other Registry keys. You can configure Autoruns to show other locations, including Explorer shell extensions, toolbars, browser helper objects, Winlogon notifications, auto-start services, and much more. Autoruns goes way beyond the MSConfig utility bundled with Windows Me and XP. And so with those lovely words from the developers (whose names are Mark Russinovich and Bryce Cogswell), we turn you loose to read more about and download our Cloudeight Freeware Pick called Autoruns. Head out right now and download yourself a copy — you’ll be mighty glad you did. Autoruns works on Windows XP, Windows Vista (32/64 bit) and Windows 7 (32/64bit). It’s a small 606 kb download. I always get baffled when trying to decide which items are vital and which I can do without. I want a program that will make the decisions that I am not capable of making. There is no such program and that’s why we recommend using common sense and googling things if you have a question.